December I took some time off to enjoy my family during Christmas preparations and also reflect on how I spent 2015 and what I wanted for 2016. So, I slowed down on designing and checking galleries and things related to JB Studio and scrapbooking. That’s why I didn’t have a Gallery Standouts of November. You can see October awesomeness here. And now, let’s have a glance at the beautiful layouts in JB Studio’s galleries at Gingerscraps and Gotta Pixel in the last months of 2015. I love how she added colors on the neutral background. Only one close-up photo leads the eye to her beautiful smile. Lovely. Jerilie is so talented and I love her pages as I love this one. Her photo treatments are always beautiful and add a special touch to the page. Love the design and that she added journaling between the photos. Great layers, too. What can I say about this page? It’s gorgeous! I love that picture, she’s beautiful and I love all the layers and clusters. It’s great to see how the colorful photo and elements pops up from the soft background. I love how colorful and happy this layout is. All the blocks and the photos of the kids having fun are great. Love the clusters, they give the final touch of awesomeness to the layout. I like that she didn’t add many elements, focusing on the photos. Great photos, btw. And that blending effect is cool. When she shared this photo in facebook I got all amazed. I live in a tropical country and have never seen snow in my life. I love that her page focus on the bigger photo. The glittered background goes perfectly with the photos. Amazing. Another amazing minimalist page by biancka. I love the pops of bold color over the neutral background. Her photos are beautiful as well. How colorful and happy this page is. Those pictures are cute and the blocking was a great way to arrange them. Great clusters, too. I like how she arranged the píctures of the skype date, I love to see there’s journaling in this page. All the little elements give it such a cute touch. I love her family photos. This one wth the kids is beautiful. I like the template she used and all the details. And here you are. 10 beautiful layouts to inspire you to scrap your own memories. May you experience a lot of happy moments this year. Hope you have an amazing creative day. 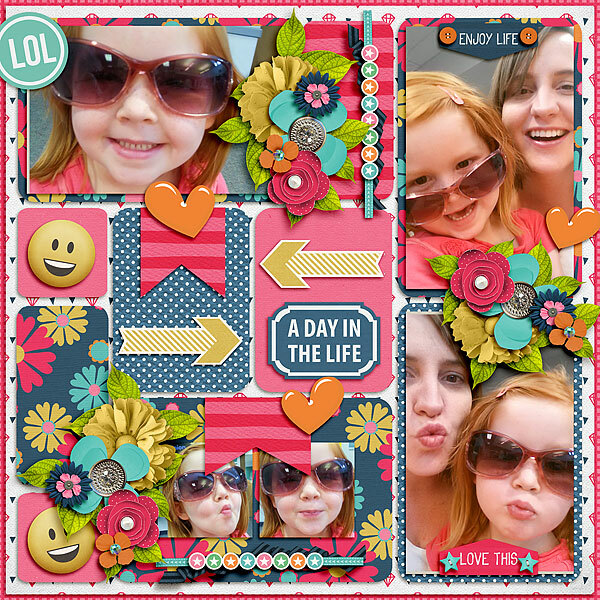 so this is digital scrapbooking – not the real one, with paper? I must admit I’ve never heard about it – guess I lagged behind a life – it looks cool! Yes, it is the same concept, but no real supplies, only digital paper, elements, etc which makes it cleaner, more open to creativity and much cheaper. I love it!